Maryfe Culiat was born and raised on the island of Guam. She is currently pursuing a B.S. 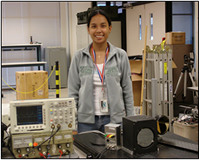 degree in Electrical Engineering at the University of Hawai‘i at M?noa. Maryfe is involved with the Society of Women Engineers (SWE) and Institute of Electrical and Electronics Engineers, Inc. (IEEE). A fast-steering mirror (FSM) is capable of rapid tips and tilts to correct jitter commonly caused by seismic movement and atmospheric turbulence. Jitter causes the images of objects viewed from a telescope to be unstable. A fast-steering secondary mirror (FSSM) allows the FSM to be close-coupled to the primary mirror, improves imaging of objects by reducing jitter, and compensates for global tilt. To achieve performance necessary to meet imaging requirement specifications, an analysis of the FSSM was done. Linear actuators are arranged in a tripod drive configuration, applying force that results in tilting the mirror. Two types of actuators were analyzed: voice coil and piezoelectric. After cost and performance analyses, it was determined that piezoelectric actuators have distinct advantages over voice coils for this application. These analyses and system recommendations will be presented.